One New York team gave a star player a $122 million extension while the other New York team allowed its starting catcher to sign with Pittsburgh as they seek to cut payroll for 2014. And the first team is the Mets and the second team is the Yankees. It's Backwards Day! The Mets had no choice but to lock up David Wright. Even the dollar store Tampa Bay Rays just gave a big contract to their star third baseman Evan Longoria. But Tampa Bay still has a good chance of eventually trading 2012 AL Cy Young winner David Price. And the Mets still have a chance of trading 2012 NL Cy Young winner R.A. Dickey. If the Mets are really starting to make the transition back to big-market team, they'll keep Dickey. As for trading Jon Niese, it depends on what they can get for him. I don't buy the "Mets have a surplus of starting pitching" theory. And Niese is not yet the kind of pitcher who can fetch a big return. But there is that little matter of not having an outfield. At least there no longer seems to be any talk of trading Ike Davis. I'm going to enjoy this Backwards Day while I can, because it is no indication of a long-term trend. 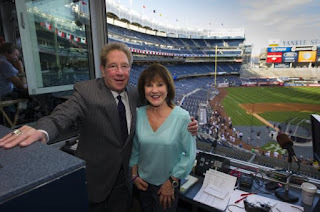 Even if the Yankees do slash payroll to reach their 2014 goal of $189 million, that's still double the Mets 2012 payroll. The Yankees will end up with some sort of name catcher, while the Mets will proclaim faith in Josh (.584 OPS in 2012) Thole. But as we head into the Winter Meetings, at least there's some good news from the Mets for a change. For the third year in a row, Brian Cashman is wasting time in the postseason by doing his dopey rappeling stunt instead of concentrating on working as GM of the New York Yankees. And this year, he's doing this stunt with Bobby Valentine, of all people. Good grief. In 2010, Cashman was apparently more concerned with getting his mug on the news dressed as an elf than he was at getting Cliff Lee signed. Cashman also did the stunt in 2011. And this year, Russell Martin left for Pittsburgh last night on a two-year, $17 million offer, reportedly without the Yankees even making him an offer of their own. And before you start screaming at me again about how Cashman's stunt is for charity, why doesn't he just write a check from his $3 million a year salary and be done with it? Is it really necessary for him to rappel down a building each year, let alone now do it with Bobby V? Not to mention all the time and psychic energy this entails. Not only is this stunt dangerous, but it takes up way too much of his time and attention. Sorry, I'm like George Steinbrenner would have been on this. Stick to your day job, dude. So who's going to catch for the Yankees next year? Is Austin Romine, who has back issues, going to get the job? (Because, you know, nothing helps back problems like being a catcher!) Or is Francisco Cervelli, who Cashman banished to the minors for most of last year, going to get the spot? Or are the Yankees going to decide to increase the jerk quotient for the team by signing A.J.Pierzynski for a year? We certainly have high hopes for him, but in terms of planning and counting on him, it’s in everybody’s interest not to do that right now and just put together as deep and strong a staff as possible and be pleasantly surprised and appreciative if we can welcome him back to the fold at some point. So this is what you gave up the player you compared to Albert Pujols for, Bri? Somebody who you can welcome "back to the fold at some point"? And yet again, present company excluded, nobody in the media questions Brian's judgement for making this trade in the first place. Nor do they wonder why, given that Curt Schilling, among others, was able to return from this same surgery in 10 months, why a surgery that was done in April 2012 should basically keep Pineda out for the rest of 2013 as well. Anyhow, if not re-signing Martin is a matter of getting the Yanks down to that $189 million for 2014, it seems an odd place to penny pinch. Because if spending $8.5 million on a catcher next year is going to break the bank, then this team is going to be a real mess. I was very excited to have the opportunity to speak with 2012 NL Cy Young Award winner R.A. Dickey earlier today. Dickey is one of the stars of "Knuckleball!," which is now available through video on demand. The DVD is available for pre-order at knuckleballmovie.com. Squawker Lisa and I were able to see the movie last spring at the Tribeca Film Festival and we highly recommend it, particularly if you are a Met fan or a Red Sox fan, since Tim Wakefield is also featured. But overall, it's a compelling story for baseball fans in general. Subway Squawkers: First of all, congratulations! Subway Squawkers: In the age of Moneyball, do you think there is going to be more of an effort to develop knuckleballers as another way for teams to get an edge? R.A. Dickey: Well, I think at the very least, it's as logical as trying to teach a hitter to switch-hit – that happens all the time. If you can teach a guy who would otherwise be released, who has good makeup and good arm strength, how to throw a knuckleball, you may have stumbled on something that could really be a benefit to your organization. The problem is, people still have this bias against the pitch. They think it's a gimmick, they think it's a trick pitch, illegitimate, whatever adjective you want to try and put there you can. It takes a little while to get people past that. Subway Squawkers: I do the blog with a Yankee fan and we've seen many pitchers have trouble pitching in New York. You’ve had such success here. Tim Wakefield was very successful in Boston. Do you think it's harder to pitch in New York, or is there something about being a knuckleballer that might have made it easier? R.A. Dickey: As a knuckleballer, you pay attention to climate from time to time, and the Northeast has always been a good place to pitch from a climate standpoint. The humidity's nice, and the field - I love pitching at Citi Field. And also, I have interests that lie outside the game of baseball, and New York is a great platform to try and invest in some of the things that might transcend the game. And I’m thankful that that's been a place where I can kind of be myself. It’s a real cathartic place for me because I can get away from the field and do some things that I really feel like have a lasting effect. So it’s a good place for me. Subway Squawkers: Trying to think of a good Kilimanjaro analogy – it was such a struggle for you to get to the top of your profession. Do you think it will be a struggle to stay at the top? R.A. Dickey: Why, sure! I don't think there’s anything about me that says the hard part is not getting to the top, it’s staying there. I’m gonna tell you, it is hard getting to the top. (laughs) It’s not easy. The only thing I can do is try to be responsible for the moments that I've given, regardless of what I've done in the past or what I hope to do in the future. I have to really be invested in the moment. That’s what works for me. Next year, I'm not going to try to be a Cy Young award winner, I'm just going to try to be me. And hopefully, at the end of the year, it will be a similar stat line. You just try to do the best you can. Subway Squawkers: After you left Texas, when you were signing with other teams, were they signing you strictly as a knuckleballer or did anybody suggest you go back to being a more conventional pitcher or maybe do both? R.A. Dickey: No, I was 100% knuckleball. That’s what I was known as. From the moment that I announced that's what I’m going to become in 2005, that’s what teams knew me as. Subway Squawkers: My cowriter on the blog has read your book and I’m looking forward to reading it. We were wondering, are you going to do an updated version of it or are you going to do a sequel since so much has happened since the book came out? R.A. Dickey: I’m in the process right now of writing an epilogue, a close to 4,000-word epilogue, kind of chronicling the 2012 season, including Kilimanjaro and the Cy Young experience. Subway Squawkers: There’s been a lot of talk about the other knuckleballers, and I know you called Phil Niekro back as soon as you won the Cy Young and I’m wondering are there other people in baseball, like say, Buck Showalter, that have also been important in getting you to this point? R.A. Dickey: There’s a lot of people I want to celebrate this with who impacted me. I am not a self-made man (laughs). I've had a lot of people who really care about me and I'm glad to be able to share this with them. This is an award meant to be shared. It's not an individual award for me. It's one that people should celebrate because they had something to do with it. Phil Niekro, Charlie Hough, Tim Wakefield, Buck Showalter, Orel Hershiser. The list is as long as Santa's naughty and nice list. It's long. Subway Squawkers: You mention that you enjoy pitching at Citi Field. The Mets are traditionally a team that has been built around pitching, so that much be exciting that you're now part of this great pitching tradition the team has had, dating back to Tom Seaver. R.A. Dickey: You know, to be considered with Doc Gooden, Tom Seaver, Jerry Koosman, the New York Mets pedigree of pitchers, the stable is deep, to be able to say I’m considered among those is a real honor. Subway Squawkers: Well, I certainly hope you'll be back with the Mets next year. We look forward to rooting for you. R.A. Dickey: Thanks a lot. I appreciate it. The last time a Met pitcher won the Cy Young Award, the team won the World Series the following year. 27 years later, I'll settle for a reason to come to the ballpark every fifth day. R.A. Dickey is a great story. Now he's had a great season. Conventional wisdom says that the Mets need to sign David Wright to a long-term contract because he's the face of the franchise and can be a long-term ambassador for the team. 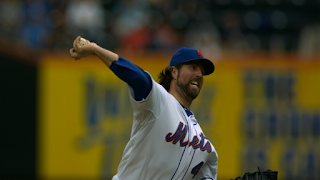 But Dickey could also be a great representative of the Mets - a unique everyman who triumphed over great odds. The odds were against my going to a Met game last September once another season was down the drain. But thanks to Dickey going for his 20th win, the Mets actually had a meaningful game in September, and I was part of a large and enthusiastic crowd. Teams trying to contend don't trade Cy Young winners. In recent years, Kansas City traded Zach Greinke, Cleveland traded Cliff Lee and CC Sabathia and Minnesota traded Johan Santana. How's that working out for them? 2012's other Cy Young winner, David Price, probably just punched his ticket out of Tampa Bay because his price (no pun intended) just got too expensive. The Rays have had a lot of success in recent years, but it hasn't translated into a large fan base. Who wants to root for a team that keeps shipping out their best players? A couple of years ago, Toronto traded away former Cy Young winner Roy Halladay, who promptly won a second Cy Young with the Phillies. But Toronto got back top prospects Travis D'Arnaud and Kyle Drabek. Isn't there a scenario in which the Mets could trade Dickey for top prospects and improve the team's chance of contending down the road? Theoretically, yes, but most prospects are ultimately just prospects. Everyone's excited over how the Mets landed Zack Wheeler for Carlos Beltran, but Wheeler still hasn't pitched an inning in the majors. He's no sure thing. And Beltran, always underrated with the Mets, has been a perennial star when healthy. Halladay is putting together a Hall of Fame career. Will other teams be willing to part with top prospects for a 37-year-old who finally found success with a knuckleball? As Squawker Lisa knows all too well, finding good pitchers who can pitch well in New York is hard enough. The best thing for the fans is to keep Dickey around. It's probably the best thing for the Mets' hopes to put together a good team as well. Lisa and I saw "Knuckleball" last spring at the Tribeca Film Festival and we both highly recommend it. The film is now available on DVD through www.knuckleballmovie.com. "Persuading the mayor to change his mind was difficult. Aides and friends said Bloomberg was not one to wallow, and he saw value in urging residents to move past the storm. These aren't people wallowing in some imagined slight. It is hard to expect people living without food, water, electricity, heat or places to live to be moving on, when they don't even have the basics. And Bloomberg doesn't sound like an engineer to me. I have worked with and for engineers, and none of them had as little concern for humanity as he does. Frankly, Bloomie just sounds like a jerk. On another note, I was privileged to go out to the Rockaways this weekend with others to help a few friends and relatives of friends with cleaning up their homes. They weren't even in the hardest-hit area there, but it was still pretty terrible. Imagine 13 feet of water rushing into your home, ruining your basement, your first floor, and very well causing permanent structural damage to your house. Imagine having your possessions ruined, and having to throw them out, with no chance of salvaging them. Imagine having your photo albums waterlogged. And the people closer to the beach got not just water, but sand pouring into their homes. Generally speaking, I'm not a big fan of when people say "I know how you feel" unless they actually do. But I do know a little of what it's like to lose nearly everything. Nearly 15 years ago, my apartment burned down, and I lost two cats and most of my possessions, with the exception of clothing that smelled like smoke. So while I am not going to say I know exactly how these families feel, I can at least relate to having your home violated and things you valued destroyed in the blink of an eye. Back then, I also received much help from friends, family and co-workers when it came to going through my ruined things, trying to salvage what was left, and moving. So I was trying to "pay it forward" a little. We felt good Saturday that we were able to help two Rockaway families -- one with packing, the other with getting rid of things. But it made me tremendously sad to see the damage firsthand that this storm caused. Every house we drove by had valued possessions ruined and sitting curbside for sanitation workers to take the items away. The trauma that this storm caused -- from deaths and injuries to ruined homes and cars to kids having to go to different schools -- is almost too much to bear. On the way there and back, we drove through Brooklyn picking up and dropping off friends to help. On the way there, we drove by 4th Avenue in Bay Ridge, where the marathoners would have run by. That street was clogged on Saturday with desperate people in cars and on foot just trying to get gas. Imagine what would have happened if those folks had not been able to get gas on Sunday, in favor of the marathon! And on the way home Saturday evening, we saw the marathon starting point, on Fort Wadsworth on Staten Island. It still had tons of porta-potties there. This, even though Mary Wittenberg, head of the New York Road Runners Club had promised to help give/loan such items to the victims of Hurricane Sandy. After waiting on line for two hours to get gasoline on Sunday morning, and succeeding, I tried to go back there to Fort Wadsworth to see if there was food and water still there for the marathon, and to take pictures, but the security denied me access. Too bad. But I did see a great sight on the way home after that -- hundreds of would-be marathoners streaming from the Staten Island Ferry to help Staten Islanders. They had more of the spirit of humanity than Mike Bloomberg ever will. Greetings, all. Squawker Jon and I are fine after Hurricane Sandy, but unfortunately, many of our fellow New Yorkers are not. Nor are many people in New Jersey, where I was born and raised. We've been very saddened over the hurricane's destruction, not just throughout New York and New Jersey, but on the Jersey Shore, one of our favorite places in the world. Fortunately, we ourselves are okay, although I did lose power on Monday night here on Staten Island, and was without power until early Wednesday morning (Con Edison did a great job getting the power back in my neighborhood quickly.) I also lost cell phone service for much of the time. I consider myself extremely lucky -- I had great flashlights in the house, so I could get around okay, and didn't suffer any damage from trees or weather (unlike other houses in my neighborhood). I live two blocks from the North Shore but my house is dry. And Jon didn't even lose power in where he lives in Manhattan! However, many Staten Islanders weren't as lucky. As of now, 19 people have died on the island. There are still many people out of their homes, and nearly half the island still doesn't have electricity. And none of us who work in Manhattan can get to work easily -- the Staten Island Ferry and SI Railroad are closed, and the lower Manhattan subways are literally under water. And forget about driving -- the gas shortage is horrible, with literally mile-long lines just to fill up the tank. Not to mention all the traffic lights still out, and Bloomberg requiring all cars going into Manhattan to have three passengers or more. Other than what I saw with my own eyes, I really didn't know the full extent of how badly Staten Island was damaged until I got my power back (many of the worst areas shown on TV are not accessible to the public right now.) Things are a mess -- it truly is a disaster area. I know people who have lost their homes, who still don't have power, who don't even have water. Some people are running out of food, thanks in no small part due to them having food spoil when the power went out. And the Red Cross never even bothered to show up until Thursday, when the borough president called them out. Anyhow, do these sound like the type of conditions that you would have a sporting event with 47,000 participants, thousands of volunteers, and, more importantly, many first responders focused on in this borough? That's why Mayor Bloomberg's decision to have the NYC Marathon continue is unconscionable, especially when he had the gall to suggest that the dead people would have wanted it to go on! "You've got to believe they would want us to have an economy and have a city go on for those who have been left behind," he had the nerve to say. No, Mikey, I think the dead people would like their families to be safe, and have the basics, like electricity and water and heat and food. I think they would also like their families to have the freedom to travel, something we effectively don't have on Staten Island right now. Not to mention that we are literally still finding deceased victims of the storm at the very same time first responders will have to break away to do marathon preparations. As for the economy issues, it sticks in my craw that according to the owner of the Hilton Garden Inn on Staten Island, the New York Road Runners Club tried to pressure him into kicking Staten Island hurricane victims out in favor of runners with reservations. Are you kidding me? That's yet another reason this race should have been postponed -- most hotels below 39th Street in Manhattan don't even have power, which means that hotel rooms are at a premium. And Manhattan evacuees are having to give up their hotel rooms for the marathon runners. How does that make any sense? Not to mention the congestion issues. How are you going to get 50,000+ people on Staten Island when the roads are so congested? The ferry is supposedly starting again on Saturday. What about Islanders who actually need to start rebuilding their lives again? Why should their needs play second fiddle to sports? Not to mention the bad taste of seeing runners throw half-full water bottles and food items to the ground at the same time so many are going without here. Every year, some marathon runners end up in the hospital. Are they going to take away already-stretched resources from the truly ill people who have already been evacuated from other hospitals due to the hurricane? Look, I love sports -- baseball is the focus of this blog, after all -- but they have a time and a place. The first baseball game after 9/11 in New York was ten days later. There was a 10-day gap in the 1989 World Series after the earthquake. The New Orleans Saints didn't play in New Orleans for the entire season after Katrina. Here in New York, we are literally still finding dead victims of this storm, and so many don't have even basic living conditions. I appreciate the marathoners' sacrifice and dedication, but now is not the time for this race. To have a marathon in this town six days after the worst storm we have ever seen is a real bread-and-circuses move, and is in extremely poor taste. Shame on Mike Bloomberg.